From August 5-6, 2017, over 400 people gathered in Berlin, Germany to celebrate the 30th Anniversary of the CARP Rally at the Berlin Wall (read the official report here). This was a significant event in CARP’s history. Thirty years ago, in 1987, CARP held its 4th CARP Convention for World Students in Berlin, gathering CARP members from all over the world. At that time, the Berlin Wall delineated East and West Berlin, separating the communist and democratic worlds. There were many protests of the Wall as world leaders sought to bring unity to a divided people and nation. CARP held several demonstrations at the Berlin Wall and was committed to bringing unity and peace to a divided Germany. That same year, the World CARP President at the time, Hyo Jin Moon (son of the Rev. Dr. Sun Myung Moon and Mrs. Hak Ja Han Moon) gave a rousing speech and desperately prayed with other CARP members at the Berlin Wall. It was a dangerous time as fights, protests, and aggressive groups battled for and against the Wall. Despite the dangerous risk, CARP members demonstrated their courage in standing for a principled, God-centered world. The 30th Anniversary celebration honored the efforts of these heroes who contributed to the eventual fall of the Berlin Wall in 1989. The 30th Anniversary Celebration kicked off with some music offered by a reunion of some of the members of the Blue Tuna CARP band, followed by welcoming remarks from current CARP leaders of Germany, Albania, Austria, France, Italy, and the United States. Then, Claus Dubisz gave a talk, “The 1987 CARP Rally in Berlin in its historical context,” which included an overview of what transpired 30 years ago and the stark reality of that time. CARP alumni from all over Europe and the United States gave testimonies of their experiences from 1987. Several alumni came to the stage in tears, overcome by the intensity and sacrifices made 30 years ago. Participants had a chance in the afternoon to actually visit memorials where the Berlin Wall used to be at Check Point Charlie, a famous American post at that time. The rest of the program continued in the afternoon with additional testimonies, performances, and the main address given by Professor Yeon Ah Moon, the wife of Hyo Jin Moon. 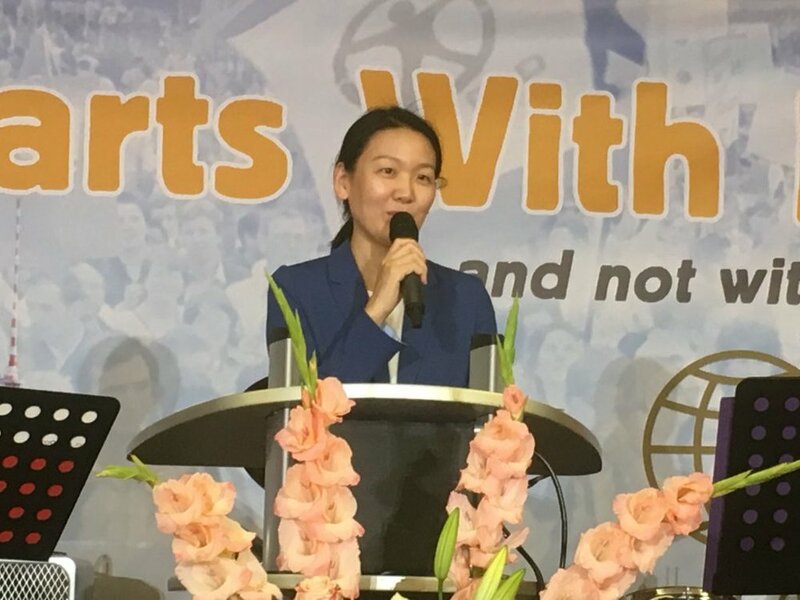 She emphasized the vision and heart of True Parents, Father and Mother Moon, in wanting to bring one family under God, without any walls or divisions between people. The following day, participants gathered for a Peace Road event and demonstration in the heart of Berlin. This signified the dream of having the world connected in peace. The theme of the gathering was “Peace Starts with Me” with an emphasis on achieving peace without violence. It’s really hard to imagine the despair and the battles fought at the Berlin Wall now, as new buildings have been constructed and people walk by on areas that were once off limits. I heard from people who were there in 1987 who could hardly believe it was the same place since so much had changed and developed. Still, they will never forget. A line of bricks runs throughout the pavement of Berlin, signifying where the Wall used to stand, dividing East and West Berlin. There are still some parts of the Wall standing, used as memorials to honor the lives that were affected and taken because of this struggle. The history of the Berlin Wall offers many lessons for us today. First, I learned that no wall can keep us apart – at least not for long. In 1987, most Berliners believed that the Berlin Wall would be there forever and became resigned to that dismal future. However, CARP always believed in and fought for peace – true peace – which can only come about when we are united together as one family under God, our Heavenly Parent. In the end, the Berlin Wall came down and ushered in a new beginning for a united Germany. Today, in 2017, it’s hard to imagine a world where the Wall existed. That’s where my second lesson came in: one day in the not so distant future, we will live in a world where it will be hard to imagine that walls ever existed. I so look forward to the celebration of the reunification of North and South Korea, which CARP members today see as their ‘Berlin Wall’ mission. At present, there are many who believe that Korea will always be divided; yet, just like 30 years ago, CARP is committed to peace and reunification. We believe it’s possible and we believe we have a special role to play. As a Portuguese-American, I used to think, “what role or what difference could I have on another country?” What reason do I have to take on a mission of the reunification of North and South Korea, when I am not Korean myself? That’s when I remembered the historic speech that the first World CARP President, Hyo Jin Moon, gave at the Berlin Wall in 1987. As a Korean who grew up in America, he was on the front line of the battle for the reunification of East and West Germany. He and countless others showed up to support peace and unification, regardless of where they were from. This brings me to my third lesson: peace starts with me. It won’t happen as long as it’s “someone else’s job” to secure peace and prosperity. It won’t happen if I think of myself as small or insignificant. It won’t happen if I don’t create it, starting from myself first, and extending into my relationships with others.